It's been a while since the last Jewelry & Nail Art post, so I figured it's about time to make a post for this delicate manicure I did a few days ago. I already showed a sneak peek picture with this mani on Instagram and I loved it so much that I even used it as my Facebook page cover, so finally this design gets the post it deserves. This nail art was inspired by the beautiful opal ring that I got from HW Star. I felt that this delicate ring deserves a matching delicate nail art, and this is what I came up with. I wanted to create a soft and delicate design to match this ring. I knew for sure that I will be using flakes top coat to try and recreate the opal look, but I had a hard time choosing the base color. Finally I decided to go with a really pale pink color, I got this idea for the color scheme from an almond tree blossom that I saw near my house. I really love it's beautiful soft flowers, they remind me a lot of the cherry blossom. 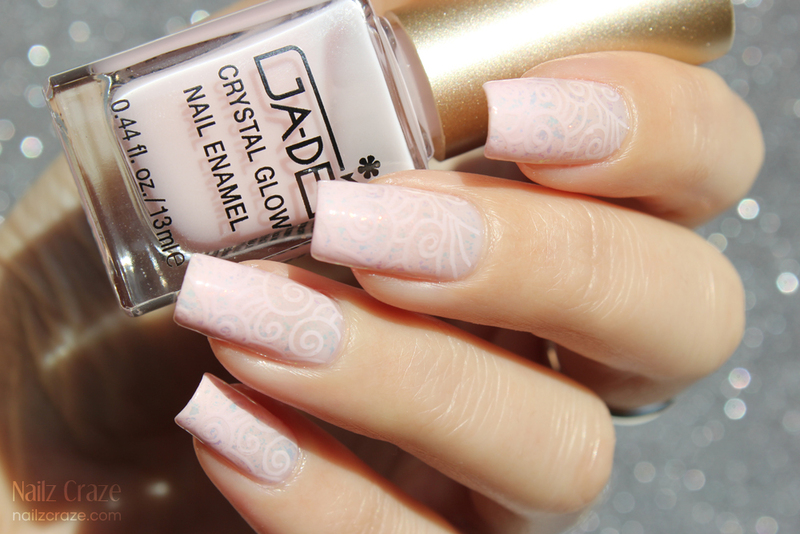 To create this design I started with two coats of Ga-De Bridal Rose (312), a sheer pale pink jelly. I didn't want this to look like a french manicure, so I sponged some pale pink over the tips / free edge of the nails, I used Essie Fiji for this. To create the opal effect I applied two coats of Nubar 2010. Itadded some dimension and sparkle to my design, but unfortunately it was hard to capture on camera and it didn't translate that well to the photos. Finally I added some stamping with the swirly design from Nailz Craze NC02 plate, using Essie Fiji as my stamping polish. At first I planned on using silver for stamping, but I realized it will look a bit harsh on this soft background. Then I though, maybe white? But finally I chose Essie Fiji, and I was happy I did! For a pale pastel it stamped pretty nice. I don't know if you can see all the details that well, and the gradient might look a bit like one color, but it was prettier in real life. I loved how this manicure turned out and it really complimented the ring. 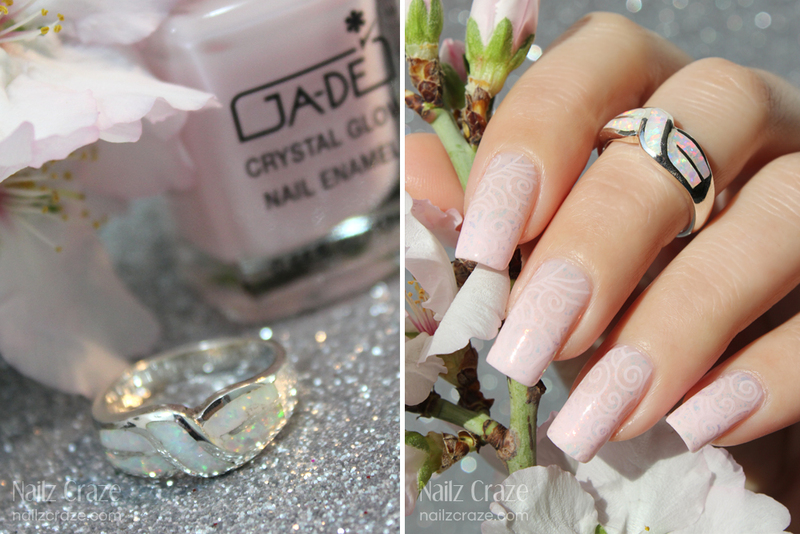 The lovely opal ring that inspired me to create this manicure is from HW Star. 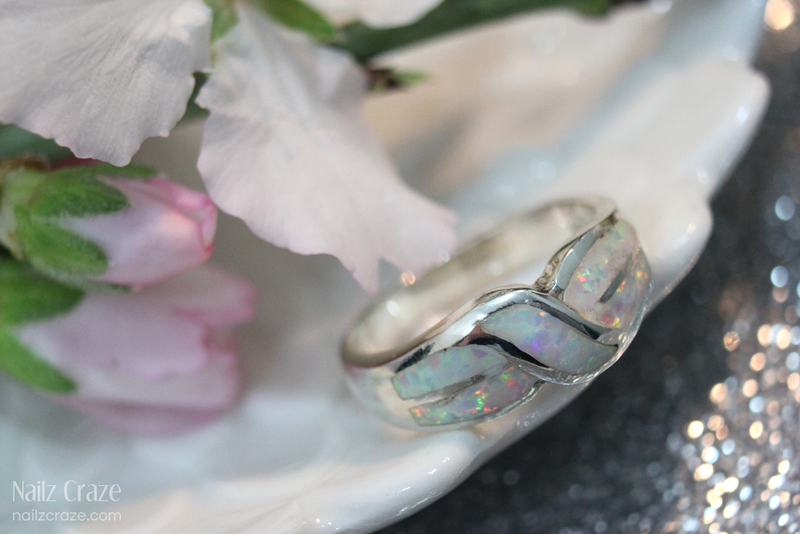 This ring is handcrafted with sterling silver and a white inlaid opal. The design of the ring somewhat reminded me of the infinity sign and I really liked that. This ring is very beautiful and the opal flakes constantly change their color, which makes it even more interesting and pretty. To find more about HW Star and their jewelry please take a look at my full review post. Thank you Lisa, you are so kind to always comment on my posts. I really appreciate this! Incredible as always! You really are the master of dainty/feminine hand poses. Someone needs to hire you for jewelry modeling! I must say your photos always leave me breathless. Do you have a specific post on what you do? I love the silver bokeh type style you have as your background. I actually get asked a lot about my photography, but I don't have a post about it yet. Wow. Just wow wow wow wow! Such a delicate one - you did the ring (which is beautiful, btw) great justice! Thanks dear, glad you liked it. 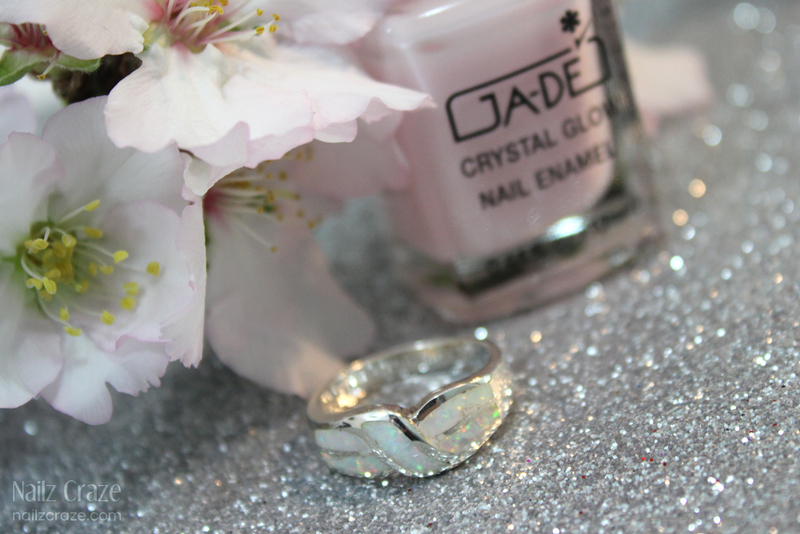 Natalie I am not good to express my feeling on English.But your work on nail art,your blog or even the photos is very impressive.When i read your post featuring my opal ring I can feel on every details you written. Thank you so much Rujipa, I can't thank you enough for sending me your beautiful jewelry. This nail art is really Delica, and the ring is absolutely fabulous. Какая красота! Очень нежно и по весеннему! just saw this. so delicate , springy, and feminine. I love the subtlety~ can be appreciated by the wearer but doesn't scream look at my nails. beautiful!